Heart disease is the leading cause of death in the United States, but it’s a chronic condition that is often preventable by making healthy choices throughout your lifetime — including and especially regarding the foods you eat and the nutrients you get on a daily basis. In fact, eating a healthy diet is one of the best ways to keep your heart in tip-top physical condition … but you may be wondering what a “healthy diet” actually entails. Most people know that they should eat plenty of fruits and vegetables while cutting back on unhealthy fats, like trans fats. This is a good start, and your diet should include a wide array of fresh, unprocessed foods at its core, but if you’re looking for more specifics, check out the list below. The foods and nutrients that follow are ideal for keeping your heart healthy, especially when combined with other heart-healthy habits like regular exercise, not smoking and not drinking too much alcohol. Fish oil is a rich source of the omega-3 fats eicopentaenoic acid (EPA) and docosahexaenoic acid (DHA). Omega-3 fatty acids like EPA and DHA support your heart by helping to maintain healthy blood pressure and cholesterol levels. 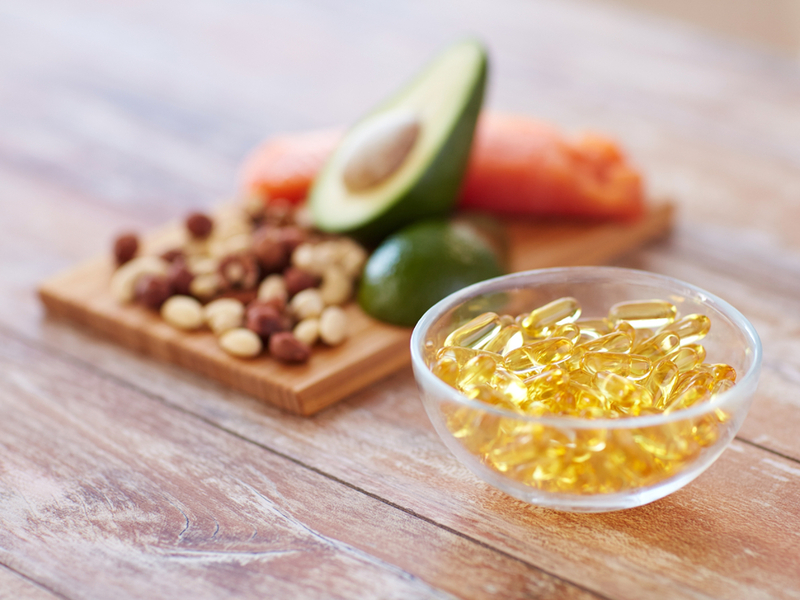 Omega-3 fatty acids also provide protection and maintenance of the healthy function of your body’s cell. You can get omega-3 fats from eating fish, but many types (especially larger, predatory fish) may contain high levels of mercury, PCBs, dioxins and other contaminants. If you are limiting your fish consumption due to contamination concerns, high-quality fish oil supplements are a safe alternative. Look for those that are ultra pure and independently tested for rancidity, mercury, PCBs, and EPA and DHA levels. Olive oil contains healthy monounsaturated fats, which have long been praised for their health benefits, including the ability to lower your bad cholesterol and risk of heart disease. Olive oil is also a rich source of antioxidant polyphenols, which are beneficial for heart health. When choosing olive oil, “extra virgin” or “virgin” varieties are the least processed and may be better for your health. Virgin and extra-virgin olive oil contain more phenolics, which act as antioxidants and also have anti-inflammatory and anti-clotting properties, than more heavily processed oils. Coenzyme Q10 (CoQ10) is a necessary component of every cell; the CoQ10 enzyme helps cells produce the energy they need to fuel your body. However, CoQ10 is not only known to support healthy energy levels, but also your cardiovascular system. Research suggests that CoQ10 is especially helpful for your heart health, and your heart contains some of the highest amounts of CoQ10 in your body. It also functions as an antioxidant, helping to protect against oxidative stress caused by free radicals. Your body naturally produces CoQ10, but tissue levels peak at age 20 and decline with age, particularly in your heart. Due to increased awareness that many prescription drugs (such as statin cholesterol-lowering drugs, high-blood pressure drugs and antidepressants) may deplete the level of CoQ10 in your body, more people are turning to CoQ10 supplements to help maintain their heart health. Meat and fish are dietary sources of CoQ10, but the amounts found in food are far less than what can be obtained from supplements. Another source of healthy monounsaturated fats, including oleic acid (the same type found in olive oil), avocados are a tasty addition to your heart-healthy diet. Along with monounsaturated fats, they also contain beta-sitosterol, a plant sterol shown to reduce total and bad (LDL) cholesterol in 16 human studies.3 Researchers have also shown that people who ate an avocado every day for a week reduced their cholesterol by an average of 17 percent, with bad cholesterol levels and triglycerides, which are associated with heart disease, declining and good (HDL) cholesterol levels rising.4 Avocados also contain an array of phytonutrients, such as carotenoids, that may support heart health. According to the California Avocado Commission, the highest concentration of carotenoids is in the dark green part of the fruit closest to the peel.5 To make sure you’re getting this most beneficial section, nick the skin and peel it from the avocado, as opposed to scooping it out with a spoon. Avocado is also a natural source of L-carnitine (see below). L-carnitine is an amino acid derivative found in almost all of your body’s cells. It’s essential for breaking down fats into energy, while also supporting your heart and healthy cholesterol levels. In fact, your skeletal muscles, heart and other tissues all depend on L-carnitine to function properly. L-carnitine is found in avocado and fermented soy foods like tempeh, as well as in animal products. However, animal products contain only small amounts of L-carnitine, making it difficult to get enough from diet alone. For this reason, a supplement can be taken to help support your cardiovascular health. If you love garlic you’re in luck, as this potent plant is excellent for your heart. Allicin, garlic’s active ingredient, produces hydrogen sulfide, a gas with many heart-protective qualities. To get the most benefits, however, garlic should be freshly crushed, not dried, processed or cooked. A recent study on rats from researchers at the Cardiovascular Research Center at the University of Connecticut School of Medicine revealed that freshly crushed garlic helped rats’ hearts recover from a heart attack better than dried garlic. The antioxidants in green leafy vegetables also help protect heart rate flexibility, helping to reduce your risk of heart disease.11 This is important as decreased flexibility in heart rate, such as can occur during exposure to air pollution, can trigger heart problems. Researchers concluded that higher intake of green leafy vegetables may reduce the risk of heart disease. Remember, heart disease is often preventable through a healthy diet and exercise. Eating a wide variety of nutrient-rich foods — with a focus on fresh, unprocessed vegetables, fruits and lean proteins — can lower your risk of heart disease and its associated risk factors like high cholesterol, high blood pressure, diabetes and excess weight. Taking appropriate high-quality supplements may also help to further support your heart health. Sources:1. The American Journal of Clinical Nutrition 2010 Dec 22. 2. Journal of the American College of Cardiology 2005; 46:1864-1868. 3. The American Journal of Medicine Volume 107, Issue 6, Pages 588-594, December 1999. 4. WebMD.com “The Avocado Advantage” August 14, 2000. 5. California Avocado Commission “Heart Health: Get the Good Fat With California Avocados”. 6. Proceedings of the National Academy of Sciences 2007 Nov 13;104(46):17977-82. 7. Journal of Agricultural and Food Chemistry 2009 Aug 12;57(15):7137-44. 8. Journal of Agricultural and Food Chemistry 2006 Mar 8;54(5):1887-92. 9. Clinical Cardiology 1988 Sep;11(9):597-600. 10. Annals of Internal Medicine June 19, 2001 vol. 134 no. 12 1106-1114. 11. American Journal of Clinical Nutrition 89: 778-786, 2009.